Rabbi Yonosan Golomb was born in 1963 in Sutton in Surrey where his father was a junior minister. Most of his childhood was spent in London where he attended Lubavitch schools. At 16, he went to yeshiva in Brunoy south of Paris, France for three years, returning in 1982 to London the newly opened London Yeshiva for a year. In 1983 the Rebbe sent him to help boost the newly opened Manchester Yeshiva and from there to Montreal in 1984-5 where he received his semicha (rabbinic ordination). 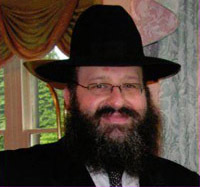 He married Faige Rochel (nee Simon) in November 1985 in Manchester and their first year of married life was spent in New York in Kollel (Higher education for married men). They returned to Manchester just before their first child Malka Doba was born. In 1987, they joined the newly opened Kollel in Leeds and in May 1992 moved to Sheffield to become their Rabbi. The Golombs now have 12 children and one granddaughter.